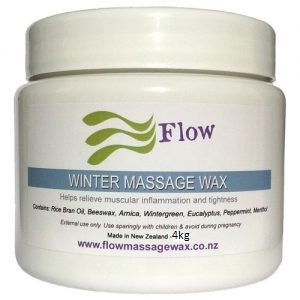 View cart “Winter Massage Wax / Balm 500g (17.5oz)” has been added to your cart. Winter Massage Wax – A favorite Massage Wax with many sports people and an alternative to Sports Massage Wax. Winter Massage Wax maybe helpful to calm muscle and joint pain. Wintergreen, eucalyptus, peppermint and menthol essential oils provides a cooling and clearing sensation for the body. 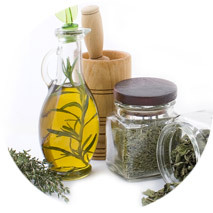 May also help clear nasal and chest congestion connected with sinus problems, hay-fever or colds. Caution: Use sparingly with sensitive skins. Please patch test this product before use – some people have uncomfortable reactions to essential oils. External Use Only, Not recommended during pregnancy. Do not use on children under 12. 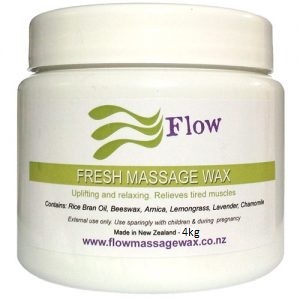 Flow Massage Wax is a carefully crafted blend of ingredients designed to suit the body work therapy needs of Osteopaths, Physiotherapists, Beauty & Massage Therapists. Created originally to meet the needs of one practice, Flow Massage Wax is now used by a world-wide clientele of body work professionals. 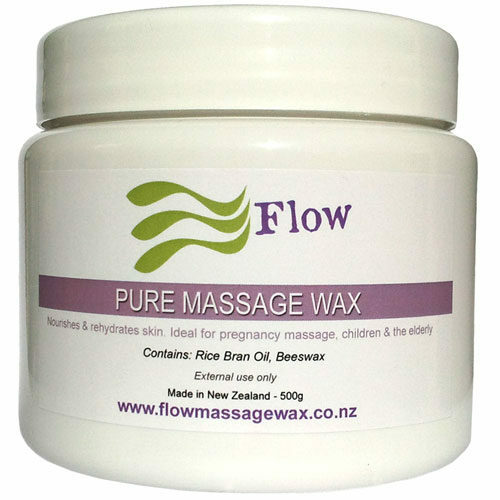 Rice Bran Oil is used to make Flow Massage Wax as it contains a healthy source of vitamins, minerals and antioxidant nutrients. 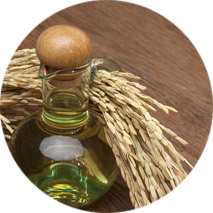 Most importantly Rice Bran Oil is high in Vitamin E which is an essential nutrient for the skin. Vitamin E provides protective moisturising qualities. Our skin has a vast absorption capacity; therefore it is important that whatever we apply to it is healthy and nourishing. 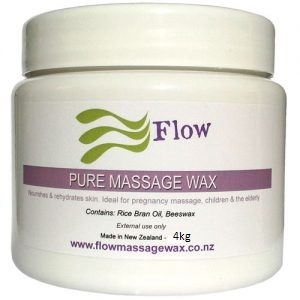 Flow MassageWax contains Natural Beeswax which is sourced from Arataki Honey in Havelock North. Beeswax contains Vitamin A, great for cell development. 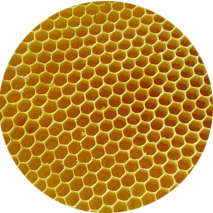 Beeswax has anti-inflammatory, antibacterial and antiviral benefits. It is softening and re-hydrating to our skin. Blended with care to create a healing and uplifting experience for your clients. 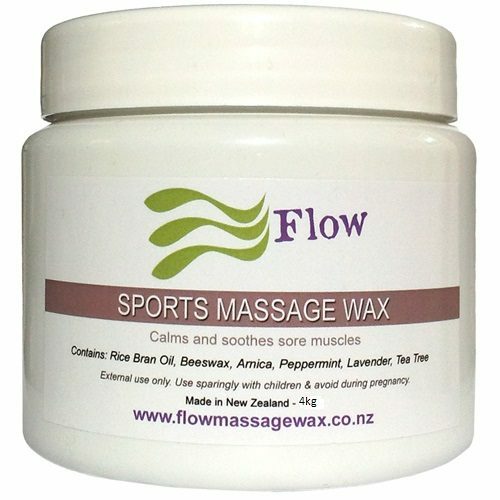 You are likely to find a fragrance that suits your needs in the Flow Massage Wax range. We have Pure, Sports, Fresh, Relaxation and Winter. Each one of these blends caters for different needs. For the young and sensitive use Pure, if you are a busy sports person try Sports, if you are in need of a chill-out experience, try Relaxation. Winter is great for clearing the head, and Fresh is a favorite for many who love it’s lemongrass fragrance. Quality ingredients make up my range of five moisturising Massage Wax blends. Created to meet all bodywork therapy requirements for Osteopaths, Physiotherapists, Beauty & Massage Therapists. 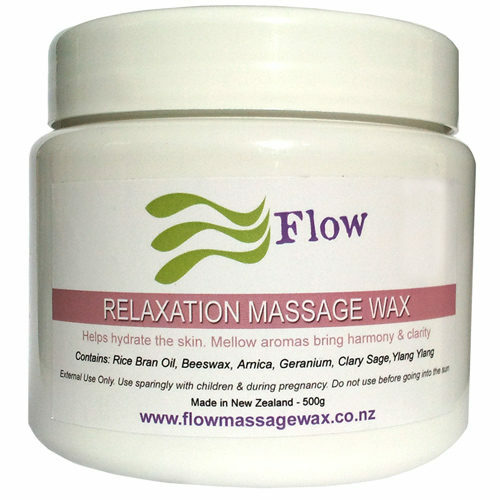 Flow Massage Wax is personally hand crafted with great care and attention to detail. It is a Natural product that combines natural Bees Wax and Rice Bran Oil which allows a smooth and gliding massage. The combination of bees wax with rice bran oil gives a soft, but solid product. Compared to massage oil, this prevents messy spills or uncontrollable slipperiness. 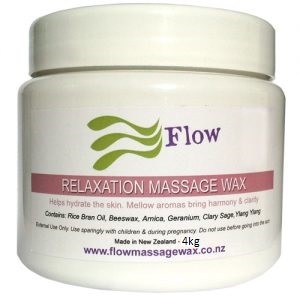 The original recipe and Flow Massage Wax blends were developed specifically for massage therapy businesses in mind, with the aim of creating a high quality affordable product for professional use. MassageWax can be very cost effective – use as little or as much as you like! I am always so grateful to use your fresh, smooth balms on my clients and myself. With all the massages I do, there are always lots of clients who enjoy feeling the smooth texture and aromas on their skin. Thank you so much. Have a great week! Christine, 2018.